Nick Andrews in action for England in the West Indies. The cricketing dream continues for Market Deeping’s veteran all-rounder Nick Andrews. At an age - he’s 63 - when most players spend their time regaling tales about the good old days, Andrews has surely reached the pinnacle of any Englishman’s career. The Werrington man has been selected to play in an Ashes series Down Under, starting in November. He will be part of England’s team in an over 60s battle with Australia. It’s not his first overseas tour with England. He played against the West Indies in the Caribbean two winters ago. And don’t make the mistake of thinking it’s a ‘jolly’ full of soft cricket. “I was named in a provisional squad of 24,” Andrews, a former Peterborough Town player, revealed. “And we had to go to Leicester for some fitness tests and practice drills before the squad was whittled down to 16. “I like to think I’m fit for my age, but it was tough and intense. It was a very nervous wait, but happily I was informed I’d been selected last week and to say I’m thrilled is an under-statement. “The last few years have been the best of my cricketing life. I’m grateful for a lenghty club career, but going on tour with England makes all those net sessions, early morning runs and trips to the middle of nowhere worthwhile. “I did think touring the West Indies with England would be the absolute highlight of my career, but playing in an Ashes series in Australia will probably top that. “It’s a serious series as well. They beat us for the first time in England last summer so we want our Ashes back!”. It’s a 12-match tour which includes three one-day internationals, which determine the Ashes, in Canberra, Melbourne and Adelaide. Unfortunately Andrews, who has skippered England in the past, will miss the final international as he has to return home for son Tom’s wedding. 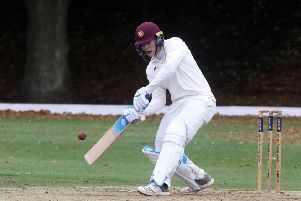 Whittlesey-based cricketer Alex Martin is currently on tour with the MCC in Bahrain and Oman. Peterborough Town second team skipper Bob Milne traveld to Sri Lanka with England Over 50s later this month.